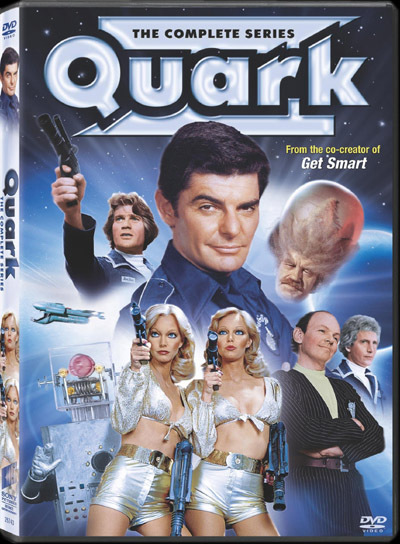 Click here to get QUARK: THE COMPLETE SERIES now! Culver City, Calif. (August 4, 2008) - Buck Henry, Oscar® nominated screenwriter (The Graduate, Heaven Can Wait) and Emmy® winner for his work on the hit TV series "Get Smart", created a wonderfully wacky sci-fi spoof Quark starring Richard Benjamin which since its debut and short run in 1977-78 has become a cult hit. Now, on October 14, Sony Pictures Home Entertainment will debut Quark: The Complete Series on DVD. In addition to Emmy® nominee Richard Benjamin (TV's "He & She"), the out-of-this-world space age comedy stars Tim Thomerson (Fear and Loathing in Las Vegas), Patricia and Cyb Barnstable, Bobby Porter, Conrad Janis (TV's "Mork & Mindy"), Alan Caillou, and Richard Kelton (TV's "Gunsmoke"). Quark: The Complete Series will be available for $19.94 SRP. The crazy plot deals with the adventures of Adam Quark (Benjamin), captain of a United Galactic Sanitation Patrol ship. His cohorts include Gene/Jean, a "transmute" with male and female characteristics; a Vegeton (a highly-evolved plant-man) named Ficus; plus Andy the Android and Betty and Betty (who always argue over who's the clone of the other). Based at Space Station Perma One are Otto Palindrome and The Head. Though Quark is supposed to stick to his sanitization patrols, he and his crew often find adventure with such colorful space denizens as the evil High Gorgon (head of the villainous Gorgons), Zoltar the Magnificent, and Zargon the Malevolent. Minisode: I Dream of Jeannie - "Anybody Here Seen Jeannie?" Minisode: Fantasy Island - "Island of Horrors"
''It'' hit the television world on February 24, 1978 like a galaxy-class starship slamming into a Quasi-norm. 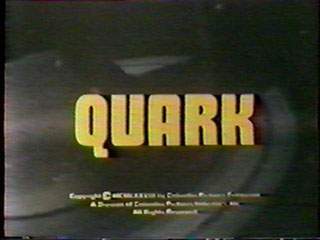 Quark, NBC's fantastic science-fiction spoof from the mind of Buck Henry, was released about the same time as Star Wars, Close Encounters of the Third Kind, Buck Rogers in the 25th Century and Battlestar Galactica were making their impact on the science fiction community. 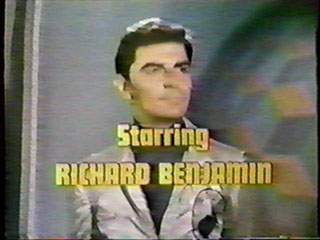 The short-lived series featured Richard Benjamin as Adam Quark along with his crazy crew aboard a spacefaring garbage scow. Our hero, Adam Quark (Richard Benjamin) commands the United Galaxy Sanitation Patrol ship. Quark's mission was to collect space baggies from United Galactic spacecraft -- but was instead always getting himself into trouble. Quark's love interests, Betty I and Betty II (Cyb and Patricia Barnstable, twins from the Doublemint commercials). They co-pilot and co-co-pilot the 23rd century starship. The pretty one is the clone. No, really. 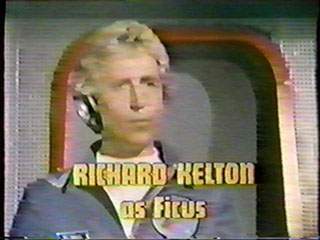 Ficus Pandorata (Richard Kelton) is a Vegeton. He is the ship's half-man, half-plant, Spock-like science officer. 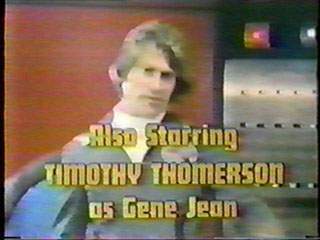 Gene/Jean (Timothy Thomerson) is a transmute. He/she has an equal number of male and female chromosomes (i.e., he's half-man, half-woman). His male half is never around when Quark needs it -- typically during a fight. 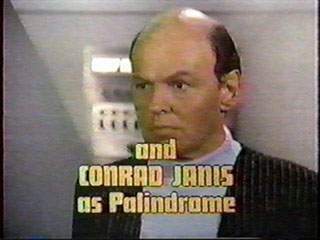 Quark's boss is Dr. Otto Palindrome (Conrad Janis from ''Mork and Mindy''). He is in charge of space station Perma One. His boss is The Head (Alan Caillou). When The Head gets a headache... yikes! Here are original NBC press releases and artwork donated by an avid Quarkie. His brother worked at NBC during the late 1970s. They include ''interviews'' with Quark's crew, personality profiles, bios of the cast, and episode descriptions. NBC Description and a letter from Horace Greeley of the year 2222 A.D.